Light Work and Urban Video Project congratulate 1985 Light Work Artist-in-Residence Dawoud Bey and 2010 Urban Video Project (UVP) artist Trevor Paglen on winning the prestigious MacArthur Foundation 2017 “Genius” Grant! Each of the 24 “Genius” Grant recipients are selected for having “shown extraordinary originality and dedication in their creative pursuits and a marked capacity for self-direction.” Grant Fellows will receive a $625,000 award from the foundation “as an investment in their potential,” paid out over five years with no strings attached. The 2017 “Genius” Grant awardees join an illustrious cohort of former Light Work and Urban Video Project affiliated artists, including Robert Adams, Wendy Ewald, LaToya Ruby Frazier, Ann Hamilton (UVP), Alfredo Jaar, Inigo Manglano-Ovalle (UVP), Fazal Sheikh, Cindy Sherman, Bill Viola (UVP), Carrie Mae Weems, and Deborah Willis. “For over forty years, Light Work has been an important place for artists from around the world to conduct artistic research, develop new projects, and exhibit their work as part of our programs in Syracuse. The MacArthur Foundation’s continued recognition of numerous artists whom we’ve had the pleasure of working with underscores the significance of the work they have contributed to the field and the value of supporting such creative minds. We certainly can’t take any credit for their genius, but we’re thrilled to get to know so many brilliant artists and to be able to be a part of their legacies. 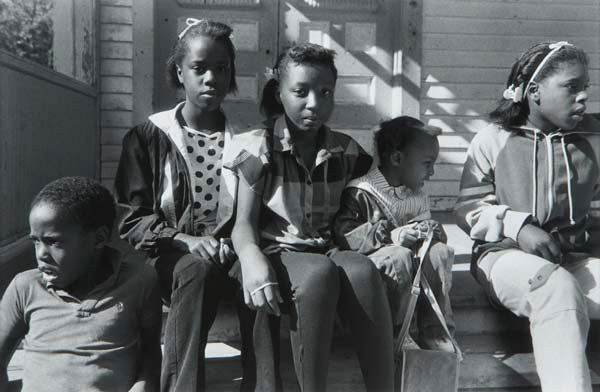 Dawoud Bey was selected by the MacArthur Foundation Grants committee for his “expansive approach to photography that creates new spaces of engagement within cultural institutions, making them more meaningful to and representative of the communities in which they are situated.” He participated in a Light Work residency program in 1985. 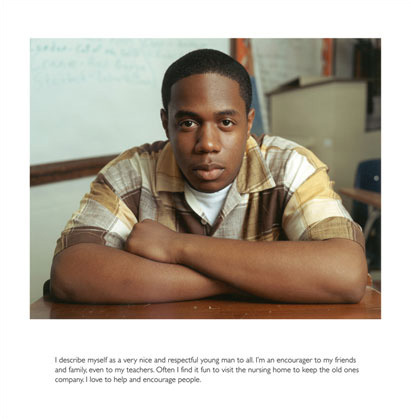 In 2009 Bey’s photographs were part of Embracing Eatonville, a group exhibition in the Robert B. Menschel Photography Gallery in Syracuse University’s Schine Student Center. Bey’s limited-edition archival print, Five Children, was part of the Fine Print Program, and selected images from his body of work are part of Light Work’s expansive permanent Collection. Born in Queens, Dawoud Bey began his formal training by apprenticing to local commercial and fashion photographer Levy J. Smith and later studied at the School of Visual Arts. He completed his undergraduate work at Empire State College and his MFA in Yale University’s graduate photography program. A former Guggenheim and NEA fellow, Bey is currently Distinguished College Art and Associate Professor of Art at Columbia College Chicago, where he has taught since 1998. The Studio Museum in Harlem hosted Bey’s first one-person exhibition in 1979. He has since had numerous exhibitions worldwide, including The Art Institute of Chicago, The Barbican Centre in London, the Detroit Institute of Arts, the High Museum of Art in Atlanta, the Los Angeles County Museum of Art, the National Portrait Gallery in London, the Wadsworth Atheneum in Hartford, the Walker Art Center in Minneapolis, the Wexner Center for the Arts in Columbus, the Whitney Museum of American Art in New York City, and the Yale Art Gallery in New Haven. 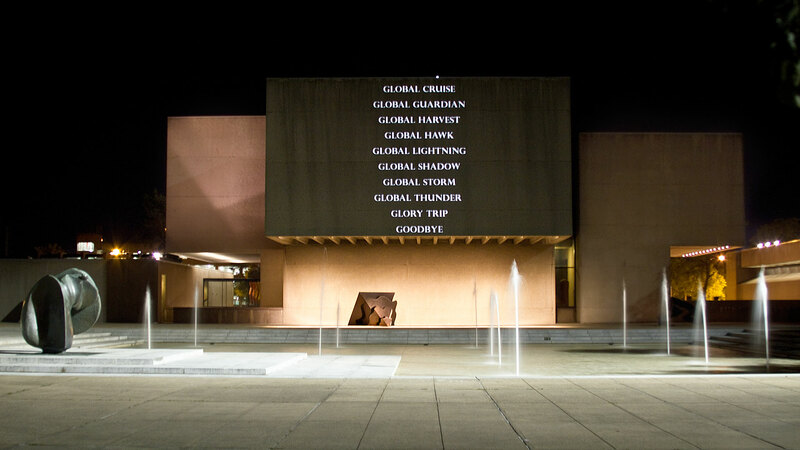 Trevor Paglen was selected by the MacArthur Foundation Grants committee for his “documentation of hidden operations of covert government projects and examining the ways that human rights are threatened in an era of mass surveillance.” Paglen’s Code Names was part of Urban Video Project’s architectural video installation at the Everson Museum of Art in 2010. Paglen is an artist, writer, and experimental geographer whose work deliberately blurs lines between social science, contemporary art, journalism, and other disciplines to construct unfamiliar yet meticulously researched ways to see and interpret the world around us. His visual work has been exhibited at Pittsburgh’s Andy Warhol Museum, Berlin’s Transmediale Festival, Philadelphia’s Institute of Contemporary Art, the Istanbul Biennial (2009), San Francisco Museum of Modern Art (SFMOMA), and the Taipei Biennial (2008). Numerous publications have also featured his work, including Aperture, Art Forum, Modern Painters, Newsweek, The New York Times, and Wired. Paglen has received grants and commissions from Art Matters, Artadia and the Eyebeam Center for Art and Technology, and Rhizome.org. He is the author of three books. He holds a B.A. from the University of California, Berkeley, an M.F.A. from the School of the Art Institute of Chicago, and a Ph.D. in geography from UC Berkeley. For more information about these and all of Light Work’s artists, please visit our Artist Index, Artist-in-Residence Program, Exhibtions,Chronology, and Collection.